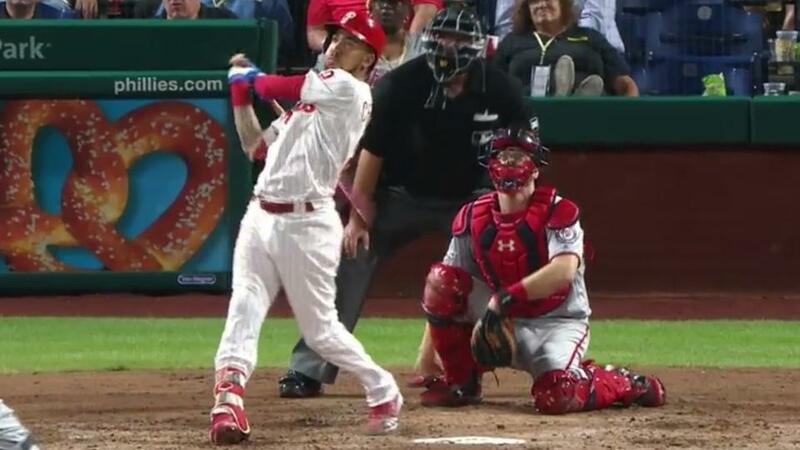 PHILADELPHIA — J.P. Crawford‘s home run in the fifth inning on Wednesday night at Citizens Bank Park might have surprised a few people. Crawford had not homered since April 14, and Phillies manager Gabe Kapler said on Monday that it might be tough to find a place for Crawford to play the remainder of the season. The shortstop had dropped far enough on the depth chart that the Phillies optioned him to Triple-A Lehigh Valley last month after he recovered from a broken left hand. But now that the Phillies are unlikely to make the postseason, priorities may have changed. Crawford, who started at shortstop for the first time since June 18, ripped a solo home run to right against Nationals right-hander Stephen Strasburg to cut Washington’s lead to 4-1. Crawford was thought to be the team’s everyday shortstop in December, when the Phillies traded Freddy Galvis to the Padres, but Crawford struggled offensively and defensively. He hit just .194 with a .645 OPS in 112 plate appearances through June 19. He also committed seven errors at shortstop. Scott Kingery assumed the everyday role at shortstop following Crawford’s hand injury. The Phillies acquired infielder Asdrubal Cabrera in July, making Crawford, the organization’s former No. 1 prospect, no longer a fit on the 25-man roster, even as a utility player. Kapler, not surprisingly, sounded upbeat about Crawford’s future, which has probably grown a little murkier with the Phillies, given Kingery’s emergence as an option at shortstop and the imminent pursuit of Dodgers shortstop Manny Machado in the offseason.